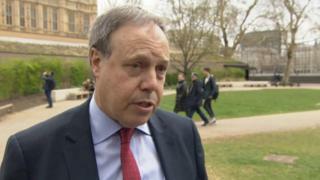 The DUP's conditions "haven't softened" when it comes to the government's Brexit deal, Nigel Dodds has said. The party's deputy leader said there had been "good" discussions, but they are not ready to offer support yet. The government needs the backing of the 10 DUP MPs in order to get the agreement through the House of Commons. It comes amid reports that Theresa May is writing to the EU to ask for Brexit to be postponed until 30 June with the option of a longer delay. Cabinet sources told the BBC on Tuesday there was "no agreement" on how to proceed with negotiations. On Monday, Commons Speaker John Bercow said he would not allow a third "meaningful vote" on the withdrawal agreement without substantial changes. Mr Dodds said his party had "good discussions" with the government, but "there were still, and are still big gaps". Earlier, a Scottish National Party MP has described the DUP's influence on the government over the Brexit deal as "incredibly unhealthy". Gavin Newlands said it was wrong one party had more sway than the Scottish and Welsh Parliaments combined. Conservative Brexiteer MPs, including Jacob Rees-Mogg, have said they will wait for the DUP's verdict on any deal before deciding whether to back it in another vote. On Monday, Scottish First Minister Nicola Sturgeon wrote to Prime Minister Theresa May about the role of the devolved administrations in talks on the future trade relationship between the UK and EU. She said she wanted to seek clarity from Mrs May about press reports that the DUP could be offered a seat at the table in future trade talks. Ms Sturgeon said she was concerned the PM's strategy for securing a majority for her deal was to accord the DUP "disproportionate influence". "It seems clear that maintaining your majority in Parliament comes before respect for the properly constituted governments across the UK," she wrote. She added there could "be no question" of one political party - the DUP - being represented in future UK-EU trade talks when other political parties and devolved governments are not. The DUP has said its negotiations with the government are not about anything other than ensuring the constitutional integrity of the UK is maintained. But on Sunday, Chancellor Philip Hammond declined to rule out a financial settlement for Northern Ireland if the DUP backed the deal.